Recreation Unlimited CEO and Executive Director Paul Huttlin poses with a group of seniors from the welding program at the DACC Tuesday evening after the display was lit up. Huttlin said the display was “fantastic,” and he thanked the students for their work on the project. 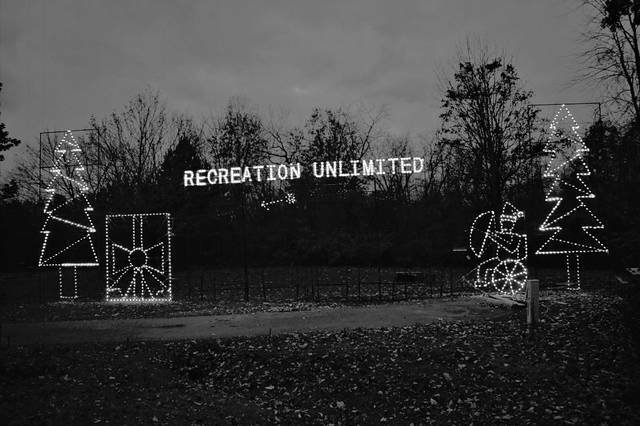 One of the first displays that attendees of Butch Bando’s Fantasy of Lights will see this season is a promotional display for Recreation Unlimited that was created by welding students at the Delaware Area Career Center. Bando said he enjoyed working on the project with the seniors, and they only lit up the child part of the display in the lab. He added, “I was like a little kid” waiting to light up the rest of it. “It was well worth the wait,” Bando said Tuesday evening in front of the completed and fully lit display. Bando worked with students last year as well to create a display for the show. He said the students he worked with this year were juniors last year and didn’t really know what to think of the project. Bando said the students worked with deadlines during the project and hoped they learned a lesson about work and management that they can take to a job in the future. Huttlin said he was mostly hands-off of the design, and he thought the child shooting the area is appropriate because archery is one of the programs offered by Recreation Unlimited. Huttlin said he hopes people will learn about Recreation Unlimited and take steps to learn about more local organizations. “I think it’s important for everybody to know different charities and what they do,” Huttlin said.